Clearly acknowledging their love of American roots music -- blues, boogie woogie, rockabilly and early rock 'n roll -- Voodoo DeVille's second CD delivers a collection new original songs plus cover versions of a few of the songs that they love to play. Voodoo DeVille is a six piece band working out of the Philadelphia area. The band was formed in 1998 by a group of like-minded guys who enjoyed the blues and enjoyed playing them even more. While Chicago blues is our starting point, we've ventured into jump, boogie woogie, early rock 'n roll, and rockabilly. We count many of the greats as our idols and influences but we don't feel bound to stick strictly to one style or one way of playing. If it's fun to play, then it's in our set list. It's never failed - when we have fun, our audience has fun. And that's why we do it. Our second CD - Lookin' For The Promised Land - includes a number of original songs. In these songs, as well as the cover songs, you can hear Voodoo DeVille's own distinctive style of American Roots music emerging. The humor that is threaded through many of the songs is a reflection of the real joy we experience in playing our music, which we hope we can pass on to our listening audience. Outstanding good time rockin' CD. 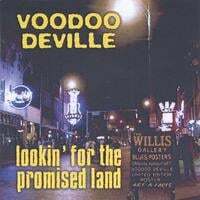 Lookin’ For The Promised Land by Voodoo Deville, offers more fun, great performances, enjoyable entertainment and just plain good songwriting than you will find in many new releases out there today. I have personally had the honor and pleasure of sharing the stage with Voodoo Deville on more than one occasion and can say that they are as much fun live as this CD suggests. Pay close attention to the original tunes on this CD. As a blues songwriter, I have to tip my hat to the songwriting skills of front man and harp wizard Buddy Cleveland. He uses humor in his songs that is reminiscent of many of the blues greats. Kudos also to guitarist / keyboardist / vocalist Steve Cocchi who’s work on T-Bone Boogie is outstanding. Don’t miss this CD! Never taking themselves too seriously, Voodoo Deville manages to produce a really enjoyable CD capable of livening up any party. This baby will keep you coming back for more. It's jam-packed with original treasures and filled with rockin' songs that will get you up and moving. Including eight great songs written by Deville front-man Buddy Cleveland. A Buddy Cleveland song is one that will captivate you with wit and humor, pushing the envelope of what one really thinks beyond what one is really willing to say. "Don't Matter How Good She Looks", "Options", and "Three Legged Dog" are testaments to the complexities of the man-woman relationship, filled with commentaries from the man's (well intended) point of view. It's the kind of banter that you'd find in-between the songs of a true "live" entertainer. The partying rock n' roll of the other songs that round out this album make it real fun from start to finish. The musicianship and production of this CD is first class and the merit of it is summed up in the title-track opening song. In "Looking for the Promised Land", these guys are finding it right here in this release.